A constant current source source can supply a fixed current to a load regardless of input voltage or load change. LM317 constant current source is one of the simplest design. The LM317 IC is quite useful as a constant current source, works on a wide input voltage range, from 3 V up to 40 V, and cheap too, here’s the datasheet. So, here’s the LM317 based constant current source, it’s design and a little about it’s working principle. First, have a look at the circuit diagram, it’s pretty basic. Only three components, excluding the power source and connecting wires. It’s really simple, you can build the circuit on a bread board or just by soldering components to each other. LM317 is said to be sensitive to reverse polarity, most designs uses a protection diode before the input. But that will add another voltage drop of around 0.7 V to 1 V, so I excluded it. The value of R sets the amount of constant current, use the formula below. Where I is the amount of constant current and R is series resistor. So R has to be precise enough and it should be capable of dissipating the generated heat. Metal film resistors are good choice for their 1% tolerance. But you can’t find a 12.5 Ohm, 6.25 Ohm or 1.25 Ohm resistor for 100 mA, 200 mA and 1 Amp current respectively. So the the trick is to use some higher value resistors in parallel combination. Like for a 12.5 Ohm resistor, you can use eight 100 Ohm resistor in parallel. Or for a 1.25 Ohm resistor, use eight 10 Ohm half watt resistor in parallel. Using resistors in parallel has many advantage over a single resistor. 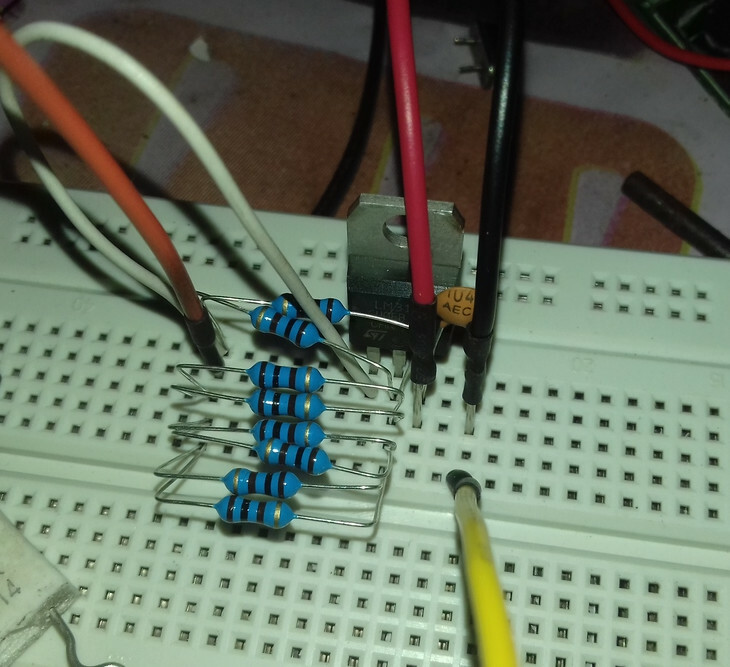 A resistor bank can be much more precise than a single high power resistor. They can dissipate the heat more effectively than a single resistor. It’s easier to get small resistors than a single high power resistor, cheaper too. What about the heat dissipation on the LM317 regulator IC ? LM317 is available in various packages, the commonly available TO-220 package can dissipate up to 500mW without heatsink for few minutes. I built a prototype 100 mA LM317 constant current source on a breadboard. The resistor bank is eight 100 Ohm carbon film resistors in parallel, around 12.8 Ohm resistance, measured with a cheap multimeter. The output constant current is around 99.4 mA, quite close to the estimated value. The input voltage was around 4.10 V, a single 18650 Li-Ion cell. I’ve used this to measure few low value resistors, 1 Ohm, 0.33 Ohm, and 0.05 Ohm. It performed surprisingly well, around 1% to 2% difference compared to the marked values. You can use this current source in many ways, few of them below. LED forward voltage measurement in constant current mode. Reliable LED driver, though not much efficient. So, that’s all about this constant current source. The next constant current source will be a variable type, 4 selectable ranges, 1 A, 500 mA, 100 mA, 10 mA, stay tuned ! If you have any suggestion, question, just drop a comment. You can use the LM317 in combination with a power transistor, the formula become then 0,6 / I = R.
If You want the schematic , send me a mail adres. Thanks for dropping by, that will be another project. I’ve sent you a mail. Of course there will be a voltage drop, depending on your required current and diode types. Use Schottky diode to minimize the voltage drop. I have tried this circuit by simulation its working fine, but when I am trying practically either lm317 gets heated up or gets fired. I don’t know what is the problem. 24V is too high, if the current is 1 Amp, there’s should be at least 10 watt power dissipating in the IC.